Can you imagine becoming an on-site local business SEO master with just one article like the one you’re about to read right now? You can become good at it if you take time to understand the information AND if you put what you read into practice. And YES, you also need access to the right information. Nowadays, the problem with a lot of the information that is available online is that most of it is scattered: a little bit here, a little bit there, and more over there. It is difficult to get the whole picture. This article is about what has worked for my local clients and an effort to get everything organized in one place. I’m also going to use this article for readers and prospects, so when I get asked a question about the topic, I can send them here. To use as little jargon as possible: I have to use some, so hopefully, I’ll awake a little bit of the geek you have within — yes, don’t lie, we all have one. Some need to look deeper, but I know it’s there. To make it grandma-proof: using simple step-by-steps that everyone can understand — I’ll do my best. To keep it PG: for all audiences, no F-words and such — sorry for those that like the F-bombs. To make it entertaining: Let’s see how this goes. Mixing entertaining with local SEO may be like mixing water and oil, so we’ll see. To make grammar mistakes: Yeah, that’s not a typo. I’m not a native English writer, and even though this will be reviewed by a native English writer pro, I can’t promise it’ll be perfect. If you like it, give it a clap, ask questions in the comment section if you have any, and if you feel reaaaaally enthusiastic today, like… man! I’m feeling good and generous today!… (as you should — life is awesome)… share it on social media. It’ll make me like you . Okay, enough jokes and messing around. Let’s get into it. Your Google My Business page — or “GMB” for short. GMB optimization is related to the results that appear in Google with a large map image at the top (image below). I’m going to be searching for something random that comes to mind…. In this case, I’ll search for “Portland orthodontist”. I’m 1.31 hours from the city center according to Google Maps. These results may vary depending on your location or the device you’re browsing with: mobile, tablet, laptop… and they show up there because of the GMB optimization (and the site as well, but more on that later). I hope you’ll agree with me when I say this is not good. One of the first steps when optimizing your local business website is looking at your home page title and description (if you have a single-location based business) — taking into consideration you have a “decent” website and it’s not all messed up. The reason why this is important is because it’s the very first thing potential “patients” — clients, customers, etc. — will see after they do a search online and before they even visit your website. If they go directly to the website, that’s another story. People mostly search using Google. If they check the organic results, they read a couple titles, then descriptions, and click based on what “clicks” with them. TITLE: If you want your business to appear on search engines in a way that “speaks” to your potential patients, clients or customers… you want to have a title that describes what you do and where. If you are thinking… isn’t that obvious? Let’s say you’re walking around pretty relaxed with some friends or family after a nice meal, and you’re craving delicious chocolate ice cream. You find two signs for ice cream shops. Delicious Italian Chocolate Ice Cream Shop. You may also add some brand awareness (your business name) so you gain “a name” with your community. Your title becomes congruent in their mind even if they don’t “see it” consciously. You also want to know what people search the most (what they type on Google the most) in order to try to appear for these searches instead of searches that nobody types. 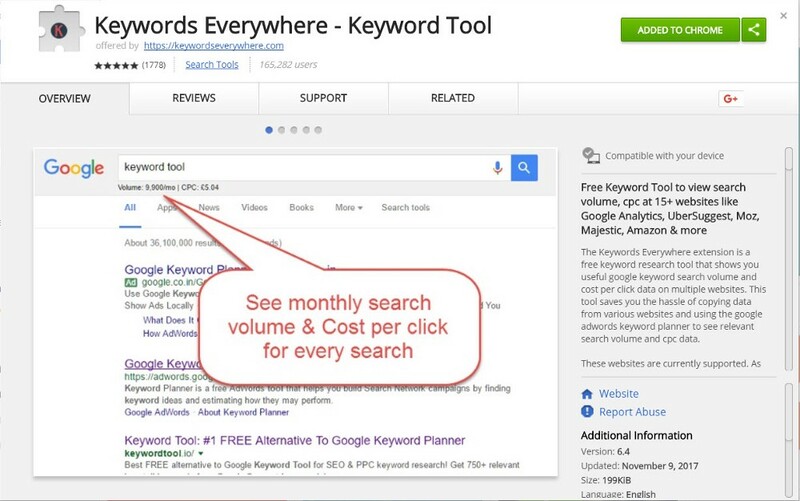 The easiest way to do this is installing a little plugin called “Keywords Everywhere” for Google Chrome. The reason why this is important is because you want to know if people search more for “orthodontist Portland” or for “Portland orthodontist”. We obviously want to optimize for “Portland orthodontist” as it has more searches per month (more people searching for that phrase). With RankBrain, and search intent, Google is making this less relevant and the order may not be that important nowadays, however I still recommend to add the highest searched combination if possible. Google will bold some letters that it considers to be related to what the search is about, and it is a good place to add your phone number and/or a call to action. The title is good because it describes what she does and where. It has variations that are related to what she does and what people may search for (“Portland braces” or “Portland invisalign”). It has a catchy title (“smile!”) and branding (name of the orthodontist). The description talks about having a great smile (what people look for when searching for an orthodontist — one of the main benefits) and when their practice began (credibility 20XX could be 2001 or the year they open their office). It also talks about insurance (good selling point) and has a call to action (call or visit the website). It talks about helping and says the word “great”. These words can give you a sensation of ease. You can also do other things such as add other geographical items like the abbreviation of the state or the zip code (OR, 97212). Something to take into consideration is to check the length of your title and description so it doesn’t get cropped. You can play with your titles and descriptions in real-time and see how they’ll look like on Google. The length of the title and description have changed over time (most common ones are 65 characters for Title and 160 for the description); just make sure they don’t get cropped. By the way, these steps don’t need to be done in this specific order. After some additional sections, we will talk about your website look, feel, and your first impressions for visitors. You can easily start from that step or any other one in this article. If you’ve done this before, no biggie, but if this is your first time, you may feel some sort of joy after it… LOL. It’s like discovering a secret that makes you feel special — or like a nerd. I personally had both feelings “my first time”, hahaha. Ok, copy your URL, paste it into the white box, and hit “Start” (image below). Then, click on the dropbox in the filter section and click “HTML”. You’ll get a filter with all your website pages… crazy, right? Then, you can really go for it and hit the “Export” button to get an Excel sheet that’ll have your titles and descriptions. If the image is too small click here to see it bigger (opens in a new tab). Ok, now we can use this information for optimizing every page title and description. In our case, we won’t do it because this website doesn’t really have much content to be optimized (more on what to write on your website later), but think about adding titles that grab people’s attention and are aligned with what the page is about. And adding descriptions that entice potential website visitors to click on your results instead of the competition. Have you ever met someone you’ll never forget? Maybe your partner or loved one? Have you ever met someone that you’ll never forget, but you’d like to forget? Don’t let your website be that guy or gal that everyone wants to forget about. Having a good-looking website that it is actually easy to use will potentially have a POSITIVE impact for your visitors they can remember and won’t want to forget. And, because of that, they may be happy to call to schedule an appointment, ask for a quote, hire your services, etc. Our ortho website example clearly needs tome TLC (Tender Loving Care) as it hasn’t been updated since what seems to be 2011. Taking into consideration that Google is launching Mobile First as I’m writing this, you need a website that is mobile-responsive (looks great in all devices) and gives the potential patient, customer, client, etc., a good experience. I don’t know about you, but I wouldn’t call. Seriously, most people with a smartphone will scream at this design (just imagine the last time you visited a page that was difficult to read, navigate, etc. and how frustrating or time-consuming it was). Millennials would be one of these demographics, and in 2015, Accenture estimated that they had a $600 billion spending power, (source) and they have been expected to surpass baby boomers in 2017 (source). If you are a millennial, would you agree with me?. Bad website = money going to your competitors. To point out the obvious, this website is very difficult to read, it doesn’t have much information, the design is pretty outdated, and it is not mobile-friendly. This will very likely lead to a “click to the back button” to search for another orthodontist competitor. I know my wife probably wouldn’t call either. The best I’ve seen ever? But, I’d be happy calling them if I needed braces. It’s pretty good (although having all the chairs in the same room feels a little bit weird to me). It gives you the ability to call by tapping on the phone number. You can tap on the “directions” link to find out how to get there. It gives you a glimpse of how the clinic looks like (with images that change when you swipe left or right). You know you’re on an orthodontist website, and it introduces you to the doctor. So, you need a website that is not only attractive to the eye, but that is easy to read and navigate in mobile, as well as in other devices like tablets, laptops, desktops, etc. You need to be sure you make your visitors feel good and have a pleasant experience. That includes things like allowing the visitor to easily find important information (contact, benefits, doctor credentials, reviews, etc.) and making your website load quickly. We’ll get into how to gain trust in a bit. I usually mention the analogy of a book when explaining Titles and Headings — or H-tags (H1 tags, H2 tags, H3 tags, etc.). The title of a page (what we covered already) is like the title of a nonfiction book. And it gives you an overview of what the book may be about. I said nonfiction, because there are a lot of fiction book titles I would never imagine what they’re about just by reading the title. You know what the book is about, right? It’s about you being a badass (that’s not cursing, so I’m still keeping my promise). Now, the H-tags, or Headings, are like the titles of the chapters of a book. You have the main title of the chapters, or H1: only one per page. And then you have sections within the chapters or subtitles (H2s). Within these sections you may also have subsections (H3s). And the list goes on and on. So when writing your website content, you want to segment your H-tags as elements or sections related to what the article is about and what the titles and H1s are about. Every page need to have a different title. H2 tags can be the same in multiple pages. An example could be a recipe website. The recipe title and H1 is unique but there may be subsections (H2) like “Ingredients” that are the same on every page. The title and H1 can be the same on a specific page. Title: Portland Orthodontist: Braces, Invisalign, Smile! H1: Portland Orthodontist: Braces, Invisalign, Smile! This title and H1 should not be repeated in any other page. Your content is the first “conversation” you will have with your potential patient, client or customer. That means you want to think about what you’re going to say and why. Hello, my name is Jesus. Wanna marry me? It is a good idea to introduce the office, the staff, and the doctor (or business owner). A video is a great way to add a personal touch, and your patient, client, or customer will feel more connected to you. Remember, patients, clients, or customers are going to see you in person, so the more exposure they have about you, the more they’ll feel they know you and are connected to you. If you see your patients, clients, or customers in person, a video (or multiple videos) is a great way to introduce yourself before you meet and create a connection. Think about how you feel about the TV shows you see all the time. It’s like you know the characters or hosts and you create a “connection” with them. In your content, you also want to talk about benefits and a couple of things we will mention in a bit. Let’s break the content down. These are the most important elements you need to have in your content for your local business. As mentioned before, having a video on your website is a great trust element as it makes visitors see you and develop a relationship. Seeing a real person creates trust. Pictures about your office can be a good thing to add, in addition, so that patients, clients, or customers can take a look at the space/office and have an idea of how it feels to be there (office video walkthrough = awesomeness when done right). And, I’ve even seen websites with the owners dancing or doing something funny if that fits your personality. Remember, people like “normal people”, and if you like to goof around, you’ll do it in person as well! Testimonials from happy patients, customers, or clients are also a must to develop trust (if you have them on video format, even better!). When people trust other people, people like them. Your affiliations to boards, community associations, charity, your license numbers, titles, studies, case studies, etc., are trust factors as well. In this day and age, there is so much information available online that can be manipulated that people have developed a sense of “mistrust”. This means that showing elements of trust will make a big difference in your practice or business. Showing your knowledge about what you do can also make people feel and know that “you know what you’re talking about”. Yes, I know that professionals should know what they are doing. But, if you show your knowledge, and they can read it, that will stick in their minds. If you didn’t say anything, they’d need to “imagine it”. It’s like you, right now, reading this guide. If I didn’t write it, you wouldn’t have not read it (duh!) and you may or may have not known I know what I’m talking about (true story). I feel I should be cracking a joke or telling a story right now to break information saturation, but I feel we are getting into a good rhythm here, right? So let’s keep going! It is very important to give visitors the opportunity to call you or contact you from every single page of your website. You don’t want them to be clicking here and there to try to find how to contact you. This can be easily achieved by having your phone number at the top of your website, a chat pop-up so they can chat live with someone, or even implementing a Facebook chatbot. It doesn’t mean they will use them all, but you are giving them multiple options to communicate with you. This would be a good idea for most businesses, unless you don’t want to be that accessible due to your own internal business processes. Having all these communication avenues increases the “trust” factor we talked about before. Some businesses may choose to not have that option due to their own processes, but as a general rule, it is a good idea. You may even have one of this green buttons that allows you to call on mobile (and looks neat). You want to get into the heads of potential patients, clients, or customers to make them feel you understand what their needs are and what they are looking for. If you pre-answer their questions, they will feel at home. An easy way to do this is to make a list of the most common questions patients, customers or clients ask you when they are at your office, or make a list of the concerns you know they have. If they have them, visitors to your website will likely have them too. For example, if you are reading this guide and you are an orthodontist, you want more patients, you want the phone ringing, and you want to profitably grow your practice. If you are a business owner that doesn’t receive “patients”, you pretty much want the same thing: more clients or customers, more phone calls, people hiring your services, purchasing your products, and growth with positive ROI. Allowing a visitor to read about all the services you provide has two roles. First, it allows potential patients, customers or clients to know what you offer — easy peasy. And, aligned with what we mentioned before, if you don’t show what you offer, then they need to guess it. Second, when done right, having pages with good content about your services will increase the size of your website — more content, its authority, and will send signals to Google to help you rank on the “maps” section of your website. When adding your categories in Google My Business, you should take note of what they are and add pages to your website that are the same within these categories. That will send Google signals that are congruent with your practice/business. (I know all these categories because I have dental clients, and I’ve already done the research for that vertical). You can only add 10 categories max, so choose from the most closely related to the least related. And, add them only if you can legally say you provide these services or procedures. (Example: a dentist that doesn’t provide oral surgery in their office could get into trouble unless clearly specified is by referral or something like that. This is not legal advice. I’m not an attorney). You should have pages with URLs that are exactly the same word within? each category. Does that mean that if you have services that don’t appear in Google My Business (GMB) you shouldn’t create a page on your website? But you certainly need to add the ones that are on your GMB listing. Most local businesses don’t understand the power of having a blog. They don’t know what to write or think it’s useless. Most business owners think they should share news about their business, what they’ve done during the day, updates about their business, and things like that. Answer more questions your potential patients, clients, or customers may have. Add supportive articles about what you do. Find different angles on how your services could help (“10 ways to ______” type of articles). Increase your website authority: The more value-based content you have on your website, the more Google will link your business to being a “leader” or “authority” in your community and in your industry. Of course, it has to be content that is related to what you do and that adds value. For example, a website is more authoritative with 100 pages/posts than one with 10. I’m not talking about 300 word blogs, but 750–5,000 word blogs jam packed with value. Value means if a visitor arrives to the page, they will read it and get value out of it. Answer more questions: It could be a great opportunity to answer questions that patients, clients, or customers ask you or your team when they are at the office. If they have these questions, other people will probably have them as well. It’s a great first contact you can have with your visitors so they get familiar with your practice or business. If they find the answer, they may be more likely to call you. Add supportive articles: Supportive articles explain what you do in more detail: services you offer, articles that talk about the technology you use, articles that add additional information to a specific procedure, etc. These posts should have a backlink to your main service page that will “support” it. This will increase the relevancy of your website, and that will help with rankings. Let’s say you do braces and you have a page that talks about braces, some information about type of braces, and so on. It’ll be a great opportunity to expand on the type of braces you have to support your main braces article. This is getting a little bit intense, but we’re finishing this section. Bear with me! Cat gif for some relaxation (recommended staring time: 1.5 min before continuing your read). We are getting pretty deep here, but this is the last part for the “content section”. This is one of the most underutilized methods to gain geographical relevance and to help your website to rank better in Google within your city. When you add pages on your site that talk about the city you’re in, things to do, etc., it gives your website GEO (geographical) relevance. That means Google will connect your city with your business, add it into the “cocktail shaker” and then bring back a delicious Google-like cocktail to rank better in your city. As you may see, the content part is pretty big. As they say: “content is king”. I’m thinking if you’ve read until here (we’re almost done), I’d reward you. Click here for a checklist of everything we’ve talked about and what’s coming. This step is directly associated with the content, but I’m writing it separately to have things more organized. Internal linking is the process of adding contextual links to your website content (clickable text) that connect pages with each other within your website. In simple words, internal linking connects pages with each other without using the links on the navigation menu. This is important, because it makes Google and other crawlers have a better idea about what your website is about and how it is structured. It makes it more organized. It also helps with distributing the power of external links pointing to your website. Each of the three last pages will link between them, and they will link to the braces page, as well. Then each of them will link to your home page if you have only one office. You want to add different and related anchor texts (the words contained within your link). For example, you can add anchor texts to the last three articles pointing to your braces pages that could be: “our braces”, “these braces”, “braces”, “brackets”, “braces colors”, etc. We’re going to get a little bit nerdy here, so I apologize in advanced. I bet you didn’t know that “image optimization” was a thing. You’d probably take some pictures or download some stock images, upload them to your site, and you’re good to go, right? You can take advantage of “image optimization” to add extra optimization to your overall efforts. Let’s say you want to add an image to the homepage of our ortho example. Google can’t fully understand images (it can find a pattern, but not 100% accurate right now), so we need to add data to the image to tell the story about what it is. b) Optimize the image size using something like: https://tinypng.com/ so it doesn’t take too many resources and helps your site load quickly. d) Geotagging Images: If you are taking pictures with a professional camera, the location of the image will be added to the images themselves with coordinates. That sends extra information to Google with the location the images were taken. NOTE: Use real pictures as much as you can instead of stock pictures as stock images contain some data you don’t want to have in the images themselves. Voilá, your image is “attached” to a location now. Slow website = slow business. If I was going to create a section about this, I would bore every single person that goes through it, so I’m going to skip it. However, I wanted to mention it, because it is a VERY important factor. There are two easy fixes, though…well, three. Reduce the file sizes on your site (images takes a lot). A lot of people talk about the “3 second golden rule” (well, I actually made the name up). Basically, if your website loads in more than 3 seconds, you’re toasted. People won’t stay. So, try to make your website as fast as possible. What is this JSON sorcery? I’m NOT expecting you to learn schema markup and JSON language, but it is important you know what it is, and EVEN MORE important, that you know how to test if it’s been added to your website. Add your URL in the box that you’ll see and click on the “run test” button. Take a look at the section on the right column (desktop). If you don’t see a rectangle with the word “Dentist” — if you had a dental, orthodontist, etc. clinic — you don’t have properly optimized schema. There’s a lot more into it and what should appear when you click on the “dentist” square, but if it shows up, that means you are on the right path. Of course, other business types would have other things there like a lawyer, restaurant, professional service provider, real estate agent, etc. If you are thinking why this is important, it is simple. Schema is a coding or “markup” language that has been popularized for search engines to be able to know what a website is about. It links your website, information like phone number and address, your social media profiles, and your logo. Then, it correlates that information with other information available online and corroborates that everything’s the same. So good schema = more SEO points for your website. If you have a business that only has one office location, your schema should go on all pages. If you have multiple offices and multiple pages for each office, schema should go ONLY on the specific pages for the specific locations. The principle is similar to the JSON schema part. If you have a single location, adding a map embedded on the footer of your website will add local relevance to the site and will connect the website with your Google My Business listing. It’ll all be creating a good “connection” between your business, where it is located, and will nicely show your visitors where you’re at! Did you made it till the end? I mean, did you read it all? There’s a lot more that goes into this, but if you apply all this information, you’ll be ahead of 80% of local business owners out there!